The continued search for Rebecca Parrett, who disappeared after her March 2008 conviction for fraud at healthcare finance company National Century Financial Enterprises, has led to the arrest of her sister. Linda Lou Case, 66, of Grove City, Ohio, was arrested by the U.S. Marshals Service on charges of lying to investigators and obstruction of justice. An affidavit for the complaint alleges Case denied having contact with Parrett to investigators but had exchanged e-mails with her sister in Mexico. 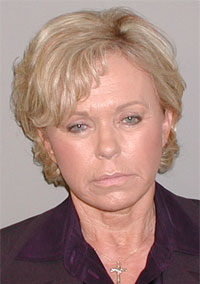 Parrett has been a fugitive since shortly after her conviction for fraud, money laundering and conspiracy and was sentenced in absentia in March 2009 to 25 years in prison. She was chief operating officer and vice chairman of the defunct NCFE, Dublin, Ohio. Parrett was one of six former NCFE executives convicted at trial, another four pleaded guilty and one was acquitted.